Democrats are betting on Tip O'Neill's famous phrase that "all politics is local" — even in the Trump era when lawmakers and candidates are forced to answer for every national controversy. Driving the news: The Democratic Midterm Victory Fund (DMVF) is hosting a Sept. 25 fundraiser in L.A., headlined by Mayor Eric Garcetti, to raise $1 million for 10 state Democratic parties across the country. Why it matters: State parties work closely with local candidates and campaigns, but don't always get the national attention and money that could make them more competitive. DMVF's goal is to introduce national donors to these state parties for the midterms and the 2020 election. This is also the latest example of Democrats re-focusing their efforts on the state level instead of zeroing in on the House and Senate. 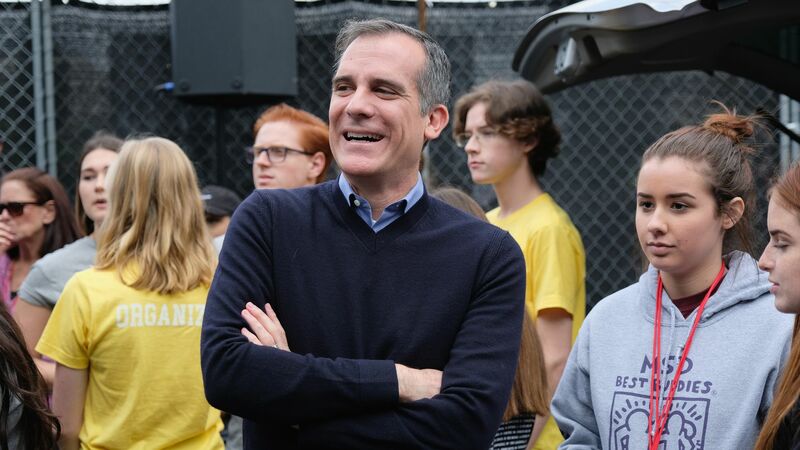 "It would be a shame to flip the House but see things like gerrymandering continue because we ignore state legislature seats," Mayor Garcetti told me. The 10 states that will receive $100,000 from the fundraiser: California, Iowa, Michigan, Minnesota, Nevada, New Hampshire, Ohio, Oklahoma, Pennsylvania, and Wisconsin. DMVF created this 10-state fundraiser after a similar event earlier this summer in which they raised $100,000 for South Carolina's Democratic Party. The bottom line: Republicans control 67 state legislative chambers to Democrats' 32. "State moves have national consequences," Garcetti said. The problem in the past, he said, is that "Democrats write it off and don’t engage with Americans who could flip."